Many consumer Internet business executives are loyalists of the Lifetime Value model, often referred to as the LTV model or formula. Lifetime value is the net present value of the profit stream of a customer. This concept, which appears on the surface to be quite benign, is typically used to compare the costs of acquiring a customer (often referred to as SAC, which stands for Subscriber Acquisition Costs) with the discounted positive cash flows that will come from that customer over time. As long as the sum of the discounted future cash flows are significantly higher than the SAC, then people will argue it is warranted to “push the accelerator,” which typically means burning capital by aggressively spending on marketing. The LTV formula, when used correctly, can be a good tactical tool for monitoring and comparing like-minded variable market programs, especially across channels. But like any model, its proper use is entirely dependent on the assumptions used in that model. Also, people who have a hidden agenda or who confuse a model with reality can misuse it. For many companies that subscribe to its wisdom, the formula slowly takes on more importance than it should. Seduced by the model, its practitioners often lose sight of the more important elements of corporate strategy, and become narrowly fixated on the dogmatic execution of the formula. In these cases, the formula can be confused, misused, and abused, much to the detriment of the business, and in many cases the customer as well. It’s a Tool, Not a Strategy. Heavy LTV companies forget that the LTV model does not create sustainable competitive advantage. You shouldn’t’ confuse output with input. The LTV formula is a measurement tool to be used by marketing to test the effectiveness of their marketing spend – nothing more and nothing less. If one asserts that buying customers below what they charge them is a corporate strategy, this is in essence an arbitrage game, and arbitrage games rarely last. Too many of the variables (specifically ARPU and SAC) are outside of your control, and nothing would prevent another player from executing the exact same strategy. It’s not rocket science; it’s a formula that any business school graduate can calculate. Do not fool yourself into believing it creates a proprietary advantage. The LTV Model Is Used To Rationalize Marketing Spending. Marketing executives like big budgets, as big budgets make it easier to grow the top line. The LTV formula “relaxes” the need for near term profitability and “justifies” the ability to play it forward – to spend today for benefits that are postponed into the future. It is no coincidence that companies that put a heavy emphasis on LTV are also the ones that have massive losses as they scale, frequently even through an IPO. Consider that most companies limit any “affiliate fee” they would be willing to spend to 5-10% of sales. Yet when they are marketing, they use different math. They use LTV math, and all the sudden it’s acceptable to spend 30-50% of revenue on customer acquisition. Find the most boisterous executive recommending excessive spending, and you will usually find a loyal servant of the LTV religion. The Model is Confused and Misused. Frequently the same group that is arguing for more spending is the same one that “owns” the LTV calculation. (This is a mistake – finance should monitor LTV). As a result, it is not uncommon for one to see shortcuts taken that allow for greater freedom. As an example, marketers often divide spend by total customers to calculate SAC rather than just those customers that were “purchased.” If you have organic customers, they shouldn’t be included in the spend calculus. They would have arrived regardless of spend. Also, many people discount “revenues” rather than marginal cash contribution. It is critical to bundle all future variable costs of supporting the customer in order to fairly estimate the future contribution. As an example of the sloppiness that exists around the formula, consider this blog post (http://blog.kissmetrics.com/how-to-calculate-lifetime-value/) from KISS metrics, a company whose aim is to “help you make smarter business decisions.” Not only do they include a version of the model that specifically ignores future costs, but also they recommend taking an average of three different results, two of which are clearly flawed. This voodoo-math has no place as part of a multi-million dollar marketing exercise. Business Isn’t Physics – The Formula Is Not Absolute. LTV zealots often hold an overly confident view of the predictive nature of the formula. It’s not “hard science” like say predicting gravity. It’s at best a “good guess” about how the future will unfold. Businesses are complex adaptive systems that cannot be modeled with certainty. The future LTV results are simply predictions based on many assumptions that may or may not hold. Yet the LTV practitioner often moves forward with a brazen naiveté, evocative of the first time stock buyer who just found out about the price/earnings ratio, or the newcomer to Vegas who has just been taught the basics of twenty-one. LTV models win arguments because executives perceive them to be grounded in science. Just because its math, doesn’t mean its good math. The LTV Variables “Tug” at One Another. This may be the single most important issue and it lies at the heart of why the LTV model eventually breaks down and fails to scale ad infinitum. Tren Griffin, a close friend that has worked for both Craig McCaw and Bill Gates refers to the five variables of the LTV formula as the five horsemen. What he envisions is that a rope connects them all, and they are all facing different directions. When one horse pulls one way, it makes it more difficult for the other horse to go his direction. Tren’s view is that the variables of the LTV formula are interdependent not independent, and are an overly simplified abstraction of reality. If you try to raise ARPU (price) you will naturally increase churn. If you try to grow faster by spending more on marketing, your SAC will rise (assuming a finite amount of opportunities to buy customers, which is true). Churn may rise also, as a more aggressive program will likely capture customers of a lower quality. As another example, if you beef up customer service to improve churn, you directly impact future costs, and therefore deteriorate the potential cash flow contribution. Ironically, many company presentations show all metrics improving as you head into the future. This is unlikely to play out in reality. Growing Becomes a Grind. Let’s say you have a company that estimates it will do $100mm in revenue this year, $200mm the next, and $400mm the year after that. In order to accomplish those goals it is going to invest heavily in marketing – say 50% of revenues. So the budget for the next three years is $50mm, $100mm, and $200mm. How realistic is it to assume that your SAC will drop as you 4X your spend? Supply and demand analysis suggests the exact opposite outcome. As you try to buy more and more of a limited good, the price will inherently increase. The number one place on the planet for marketing spend is Google Adwords, and make no mistake about it, this is an increasingly finite resource. Click-outs are not growing at a meaningful pace, and key word purchases are highly contested. Assuming you will “get better” at buying while trying to buy more is a daunting assumption. The game will likely get tougher not easier. Purchased Customers Underperform Organic on Almost Every Metric. Organic users typically have a higher NPV, a higher conversion rate, a lower churn, and more satisfied than customers acquired through marketing spend. LTV heavy companies are in denial about this point. In fact, many of them will argue until they are blue in the face that the customer dynamics are the same while this is rarely the case. A customer that “chooses” your firm’s services will be much more staisfied than one that is persuaded to buy your product through spend. Find any high-marketing spend consumer subscription company, and I will show you a company with numerous complaints at the Better Business Bureau. These are companies that make it almost impossible to terminate your subscription. When you are scheming on how to trap the customer from finding the exit you are not building a long-term brand. LTV Obsession Creates Blinders. Many companies that obsess over LTV, become overwhelmed by LTV. In essence, the formula becomes a blinder that restricts creativity and open-mindedness. Some of the most efficient forms of marketing are viral, social, and effective PR (public relations). Most companies that obsess about LTV are less skilled at these more leveraged techniques. Ironically, it’s the scrappy and capital starved startup with absolutely no marketing budget that typically finds a clever way to scale growth organically. 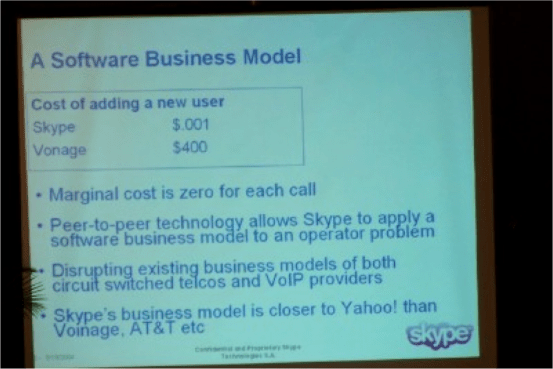 I love this historic slide from Skype comparing their SAC with that of Vonage, an iconic disciple of LTV analysis. 10. Tomorrow Never Arrives. The Utopian destination imagined by the LTV formula is a mirage. It almost never works out as planned in the long run. Either growth begins to slow, or you run out of capital to continue to fund losses, or Wall Street cries uncle and asks to see profitability. When this happens the frailty of the model begins to appear. SAC is a little higher than expected. You met your growth target, but the projected loss was bigger than expected. Wall Street is hounding you for churn numbers, but you are reluctant to give them out. The lack of transparency then leads to cynicism, and everyone assumes the worse. It turns out that the excessive marketing spend was also propping up repeat purchase, and pulling back to achieve profitability is increasing churn. Moreover, a negative PR cycle has ensued as a result of your stock decline, and the press’ new doubts about your model. This also impacts results, and customer perception of your brand. The bottom line is that “one day we can stop spending and be remarkably profitable” rarely comes to fruition. It is not impossible to create permanent equity value with the LTV approach, but it’s a dangerous game of timing – you don’t want to be the peak investor. 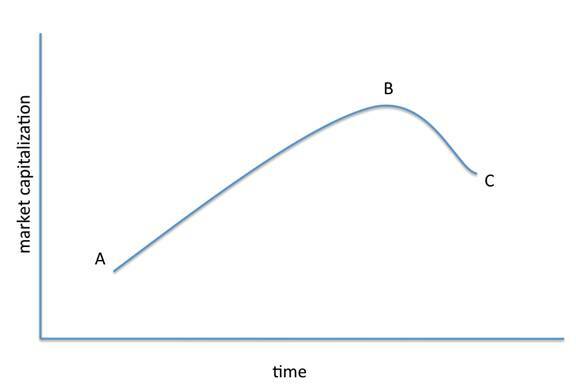 Let’s say a new business starts with an early market capitalization of A (see graph below). Through aggressive marketing techniques, and aggressive fund raising, the company is able to achieve amazing revenue growth (and corresponding losses), but nonetheless creates a rather sizable organization. At this point, the company is value at point B. Eventually, however, gravity ensues and the constraints outlined herein raise their head, resulting in a collapse to point C. For early founders and investors at point A, they may do OK (as long as C>A), but it will be accomplished on the backs of later stage investors that helped fund the unsustainable push to point B. This is the story of many a telecom and cable provider expansion history, as well as a few recent Internet companies. This should not be misconstrued as a eulogy for the LTV formula. It has a very important place in business as a way to contrast and compare alternative marketing programs and channels. It is a tactical marketing tool that requires candor and thoroughness in its implementation. The fundamental reason that it is so amazingly dangerous and seductive is its simplicity and certainty. Generic marketing is conceptual. LTV marketing is specific. Building a plan to grow to a million users organically is an order of magnitude more difficult than doing it with the aid of the LTV formula. There is comfort in its determinism, and it is simply easier to do. Some people wield the LTV model as if they were Yoda with a light saber; “Look at this amazing weapon I know how to use!” Unfortunately, it is not that amazing, it’s not that unique to understand, and it is not a weapon, it’s a tool. Companies need a sustainable competitive advantage that is independent of their variable marketing campaigns. You can’t win a fight with a measuring tape.